Today more and more families are looking for ways easy ways to eat healthy meals. Most likely the women of the house works, which makes it even harder to be able to prepare a truly healthy dinner from scratch for her family. What we're planning here is a great list of quick and easy recipes. We're going to be sharing recipes for beef, chicken and pasta. We'll have soups and stews as well as desserts. We have some fabulous easy one pot meal recipes. These recipes can be made over the weekend and easily re-heated during the week. There's nothing like a hearty bowl of chili with some crusty French bread. It's especially easy when the chili is prepared ahead of time. Some of our favorite vegetables, such brussels sprouts are simple to cook. A coating of olive oil, salt and pepper is all you need to make delicious caramelized roasted brussels sprouts. We guarantee that even your family who say they don't like brussels sprouts will love this brussels sprouts recipe. We hope you'll enjoy our easy recipes and try them soon! All these easy to print recipes are from trusted sources and come include helpful Cooks Tips. Visit often as we'll be adding new recipes! We're adding some delicious soup recipes to our site. Try this quick and easy recipe for Green Bean Soup. Our newest easy vegetable side dish recipe comes from Food & Wine Magazine. 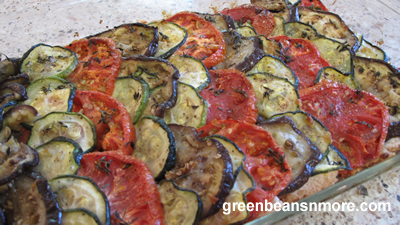 It's a delicious baked eggplant gratin.